Hand drills are sometimes panned as old-fashioned tools, but they offer a high degree of control for serious woodworkers. In this post we examine five of the best selling rotary drills on the market and see how they compare. The best of the bunch is probably the Fiskars Manual Rotary Craft Hand Drill. Buyers say that it's a great crafting option if you want something portable, that doesn't need to be charged, is strong, doesn't create any noise and just works. What Is A Rotary Drill? Anyway...what is a hand drill? It's is a tool that’s powered by human energy rather than electric power. Hand drills either work by turning a crank with a gear mechanism or by rotating the handle itself. These rotary tools are practical for smaller projects where control and precision are required and for times when electricity isn’t available (Source). These rotary cranks work by the force provided by rotating a crank or the drill’s handle to rotate its chuck (Source). Although these manually powered tools have been overtaken by power and rechargeable power drills, they’re still widely used by traditional woodworkers. When looking for a rotary drill, many experts say to look for auger bits, which can easily be found online and at antique stores. They also recommend a you select one with an “egg beater” crank for their precision (Source). The following manually powered tools should be perfect for light woodworking projects and small household projects. • The Schroeder 1/4 inch Hand Drill offers better control for more accurate drilling. Smooth gear operation and wood handle, which is more comfortable than man-made materials. This option is lightweight and reasonably well made, however, it’s generally suited to small household tasks where control and working in tight spaces is essential. • The Fuller Tool 890-1072 12-Point Reversible Ratchet Brace features a 4-jaw chuck and is advertised as being “professional grade.” It holds 1/8 inch to 7 1/16 inch bits as well as tapered shanks. Users noted that this option, while decent quality, does not hold standard drill bits, spades or auger bits and that finding the right bits at your local hardware retailer could be difficult. • The Weichuan 1/4 inch Hand Drill features 3 jaw chucks and is designed for precision drilling, especially where delicate wood is involved. This option features double pinion gears, which means there’s less chance for them becoming stripped during use. Chuck is easy to tighten with a key and bits remain secure during drilling. Users give this high marks for the quality and the ability to handle small jobs with ease. 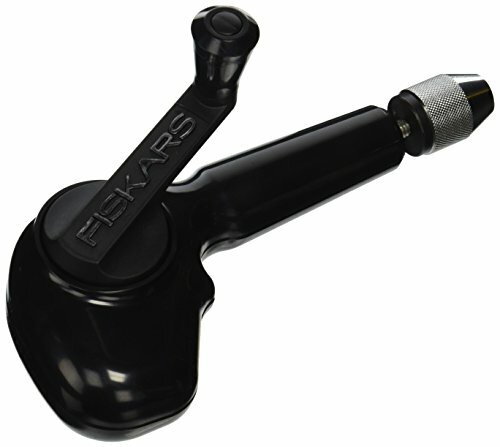 • The Fiskars Manual Rotary Craft Hand Drill features a crank in the “egg beater” style rather than rotating the handle. This provides a smooth operation. Users say this crank is extremely versatile and well-made and holds standard bits you can find at your local big box retailer, and can even hold Dremel bits as well. Perfect for small jobs and craft projects. 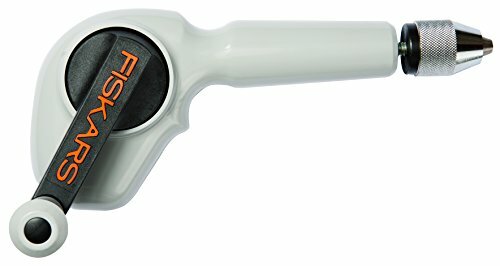 • Last up is the Fiskars 8511694 Hand Drill also features an egg beater style crank and is perfect for boring into wood, plastic, sheet metal or acrylic. The gear ratio and crank provides for smooth operation and allows for more precise control because it remains stable. Will accept bits up to 1/4 inch. 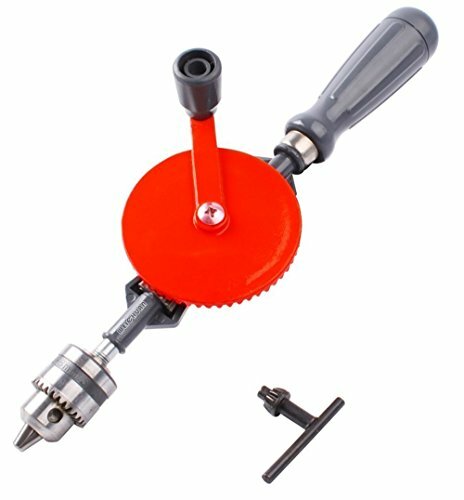 Buyers say it operated well and is perfect for small jobs or making starter holes where precision is essential. The Fiskars Hand Drill is a solid option if you are looking for a hand drill which is ideal for drilling holes in tough to reach and delicate spots. Users like the performance of this machine, but do complain about the quality. 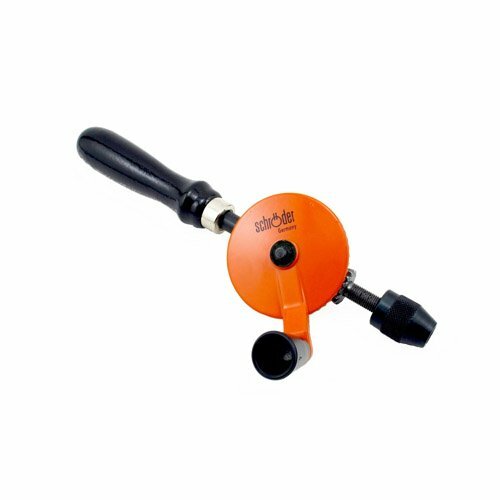 This product is ideal for drilling holes in various materials (such as wood, plastic, paper, sheet metal, acrylic, mixed media,etc.). Its contoured body provides a comfortable grip and its gear ensures consistent drilling pressure. This hand drill seems like a solid choice if you want a smooth operating gear system completely enclosed in a durable ABS housing. The general user consensus concerning the Fiskars Hand Drill is that it is a perfect tool for small jobs or craft projects that require working in tight spaces. They praise its lightness, easiness of use and comfortable feeling in the hand. However, buyers complain about the quality. Many of them share that the gear got stripped after light use. If you are looking for a top-rated hand-powered crank, you might want to consider this one offered by Fiskars. Users love the usefulness of the option, but some do complain about difficulties with using it. This product makes it easy to add holes to wood, plastic, paper, sheet metal, acrylic, mixed media and more for craft projects. It features an easy-to-turn hand crank which is great because it offers battery- and cord-free use. The package includes four standard bits: 1/8, 3/16, 5/32 and 3/32 inch bits. This rotary powered drill could be a good choice if you want a tool with smooth, consistent operation. In general, users have a favorable opinion of the Fiskars Manual Rotary Hand crank.They agree that it is lightweight, well-made and fairly sturdy. Satisfied buyers recommend it for craft projects and lighter-duty household projects. However, some buyers complain about it being slow and awkward to use –hard to get any leverage and hard to keep fingers out of the way of the crank. One purchaser says that the machine is not suitable for extended use. Another one complains about difficulties with holding it while boring into anything substantial. The Weichuan Hand Drill is a good option for a craftsman who craves precision and power. Users love the effectiveness of this product, but some do complain about wobbling. This product allows for easy and accurate boring into delicate woods, plastic, metal and fiberglass. It features very strong double pinions and a steel cast construction with a smooth ABS engineering plastic handle. The 3-jaw chuck works with 1/4-inch bits(0.6mm – 6mm). This hand tool might be a good choice if you want a multipurpose manual powered tool. In general, users have a favorable opinion of the Weichuan Hand Powered crank and they agree that it is well-made, fairly sturdy and easy to use. They find it to be of great assistance for small projects. However, some purchasers complain about the red hand crank/gear which is not tight enough to prevent wobbling. One purchaser complains about the plastic handles and imperfect paint finish. The Fuller Tool 12-point Reversible Ratchet Brace is a solid option if you are looking for simplicity and durability in a tool. Users love the construction of this tool, but do complain about the flimsiness. This product is a professional grade 12-point reversible ratchet with a 4-jaw chuck. It is designed to hold 1/8-inch to 7/16-inch shank bits, as well as tapered shanks. The tool also features a 10-inch sweep for maximum leverage and drilling speed. This item could be a good choice if you are looking for a draw knife with a good control over wood shaving. In general, buyers are pleased with the Fuller Tool Hand Drill. They state that it is well-designed, solidly built and easy to use. However, some buyers complain about the chuck which doesn’t hold the bits tightly. Many complain about the drill being flimsy. Several purchasers state that their item broke quickly. If you are looking for a hand powered crank, you might want to consider the Robert Larson Hand Drill.Users like its handiness, but do complain about it not being very heavy-duty. This 1/4-inch rotary crank features a 3-jaw chuck, smooth gear and a comfortable wood handle. The gear ratio in this sturdy hand tool provides ample power and speed. If you are looking for a tool which provides control and safety when drilling small, critical holes, this might be a solid option. In general, users are happy with the Robert Larson Schroeder Hand Drill. They like that it is very solid and sturdy, and they also praise that it is quiet and ultra-portable. Users conclude that the tool is very handy when the power goes out. However, some buyers complain about it being useful only for very light applications. An online reviewer suggests getting a different model for woodworking, especially on hardwoods. Hand drills are a very important tool to include in the tool-kit for any woodworker and for those people who don't like to use power tools for their woodworking. There are many different types of these rotary tools. Some use electricity to power them (also known as electric hand drills), others use compressed gas to power them (pneumatic), some are powered by an internal combustion engine (such as earth drilling augers) and finally, there are options that are manually powered, which means that the user has to manually wind them up like a wind-up toy to power the hand drill. Some tools work through percussive action (such as hammer drills) are typically used to work on tough and hard materials such as various types of masonry like stone, brick and concrete, or rock. Drilling rigs are likewise mainly used to bore holes into the earth to create a path to underground oil or water. In this way, drilling rigs are used to bore holes to form water or oil wells or to develop holes for the purposes of geothermal heating, which are typically bored using large scale drilling rigs. Some varieties of these specialty finger poweredtools are also typically used for the purposes of driving in screws or other fasteners easily and quickly. 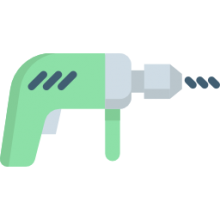 Other examples of manually powered tools include small gadgets that don't have an in-built motor and are instead powered manually with the help of grinders, small pumps, etc. Traditionally, a rotar crank is a manually powered tool that takes the circular motion of a hand-powered crank to provide circular motion energy to the chuck. Although these kinds of hand-powered tools have mostly been replaced by newer and modern power tools, rotary tools are still used by a lot of people whose work is all about woodworking. The manually powered rotary tools are made up of a cranking handle that has to be manually turned, which in turn, turns the pinion gears of the main shaft. There is a chuck at the end of the shaft which holds the bit. The other end of the shaft contains a second handle for gripping that the operator holds still while the chuck is being turned. The bit at the end of the shaft has to be chosen from among a number of available bits, dependent on the dimensions of the hole that needs to be drilled. For example, a typical hole of a width of 3/8 of an inch will need a specific drill bit to make a hole of that width. While using any kind of tool, the user must take special care to be careful and not end up injuring themselves due to carelessness. That is why, in order to safely use one, you should first of all loosen up the chuck and then put in the specific bit required for the job, and then twist the chuck tightly so that the bit is firmly fixed in place. Now position the tip of the bit to the point where you want to create the hole, and also ensure that the bit is touching the point at the same angle as you want the hole to be shaped in. Now start turning the cranking handle, which will rotate the bit and start the process of drilling the hole. When you are using small and tiny bits, take care to not exert too much pressure on the gripping handle or the bit might bend or even break apart. Although rotary powered cranks don't need a lot of regular maintenance, you should still take care of them because they can get damaged if you don't use it properly. For example, you could damage it by using the wrong type of drill bit or by exerting too much pressure the tool. For the best efficiency over the long term, get into the habit of putting some oil in the chuck gear and the crank pinions from time to time.